Caption slip reads: “Daily (or whenever). Photographer: Richardson. Date: 1954-12-15. Reporter : Swaim. Assignment: Dedication, Pasadena. 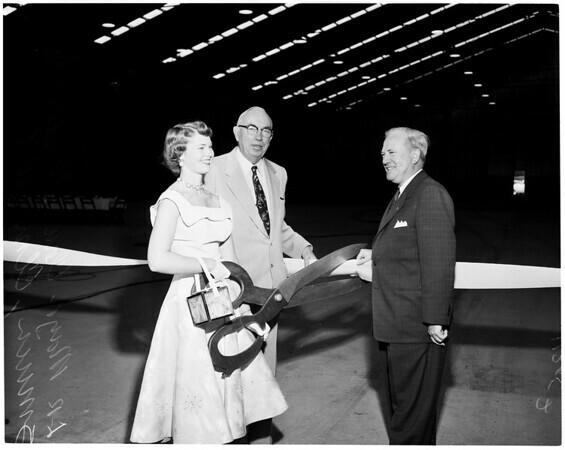 K41/42: L. to R., Mayor Clarence A. Winder of Pasadena, Rose Queen Marilyn Smuin and Elmer Wilson, Tournament of Roses President, snipping ribbon to dedicate new float construction building in Pasadena”.